The Thanksgiving holiday afforded me some time to escape to West Virginia for a quick family history road trip. 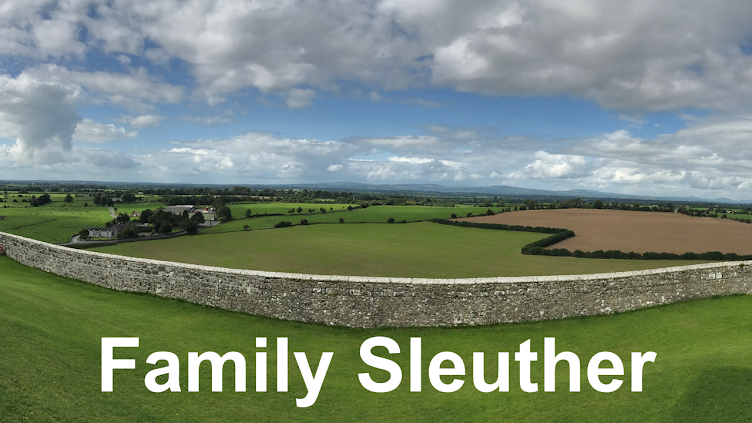 Mounting evidence is coalescing around the theory that Joseph and Sarah Kirk were the parents of my fifth great-grandfather Thomas Kirk (1778-1846). 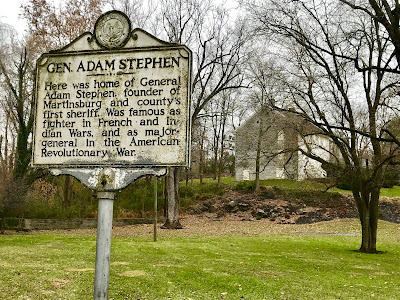 Joseph first appeared in Berkeley County, Virginia (now West Virginia) in April 1773 when he leased 100 acres from George William Fairfax, a friend of George Washington and proprietor for thousands of acres in Virginia's Northern Neck. Joseph's parcel was part of a larger 1,700-acre tract of land called Poplar Spring. Mapping the location of his 100 acres proved quite challenging. The lease's land descriptions detailed borders anchored to trees and hills. 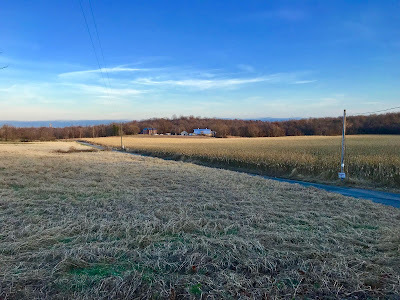 There were no GPS coordinates that would allow me to pull up the property's boundaries on Google Maps. 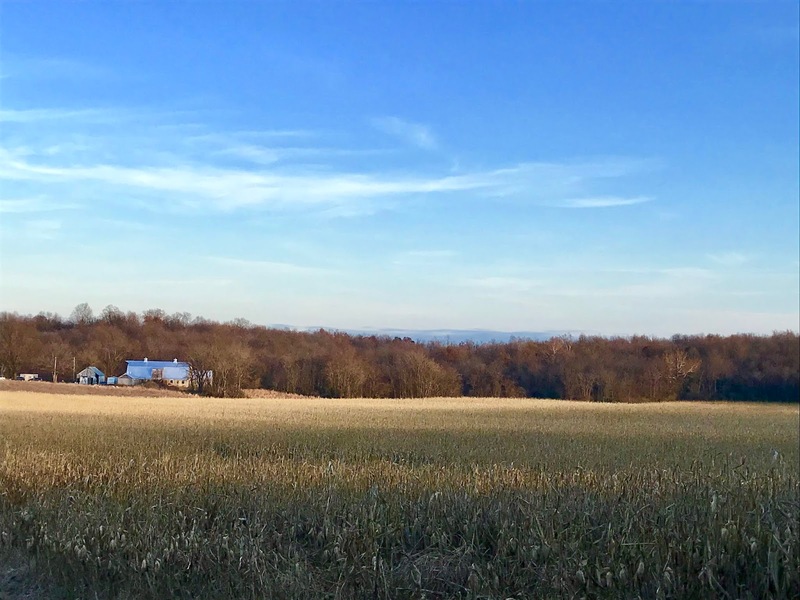 I was getting tired of sifting through centuries-old records for the faintest of clues as to the farm's location. I wanted to go to Berkeley County and get a feel for the area. Maybe I'd be lucky and make new discoveries leading me to the farm's location. Less than two hours northwest of Washington, DC, it was an easy road trip to make. 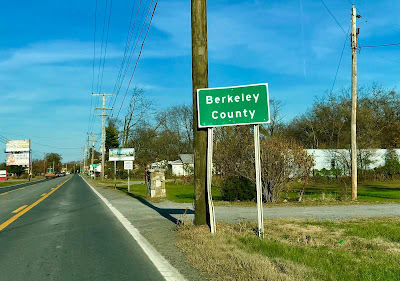 Beginning in Winchester in Frederick County, Virginia (the county from which Berkeley was formed in 1772), I drove along Highway 11 - the old Winchester Road that existed in Joseph's day - north towards Martinsburg, Berkeley's county seat. Driving on the same road that Joseph Kirk may have traveled on - albeit paved and using a much different mode of transport - was like traveling back in time. 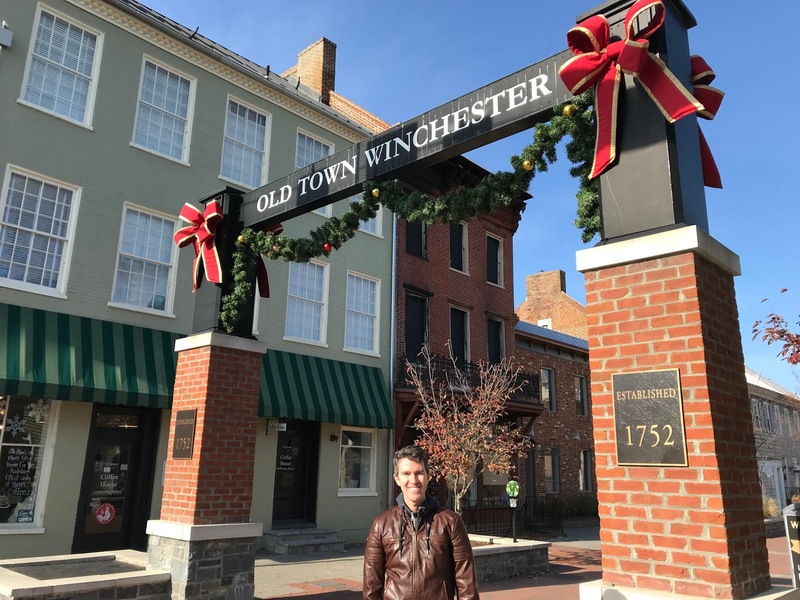 I could imagine men on horseback and with wagons making the journey to and from Winchester. 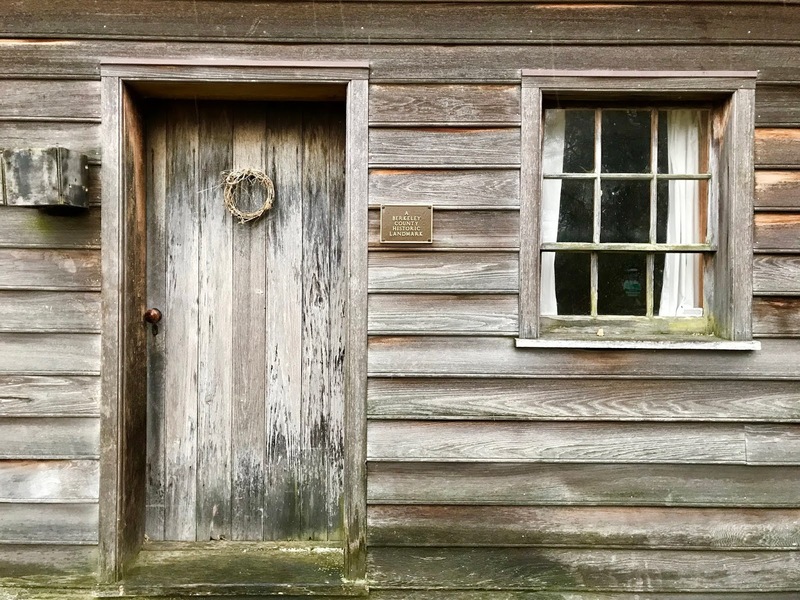 Once in Berkeley, I visited two historical sites to see the types of homes that existed during Joseph's era. One, a rustic log cabin, dated to the 1730's and used throughout the century, illustrated how early settlers in the Virginia county would have lived. 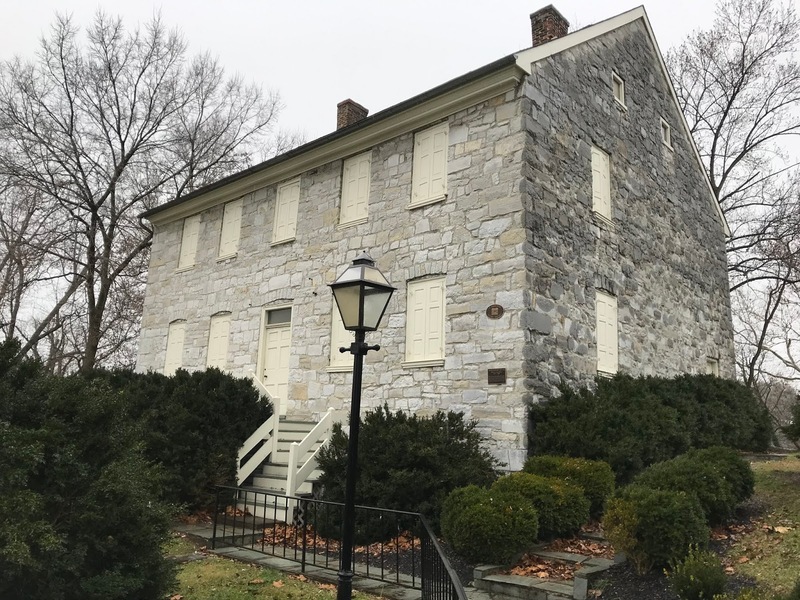 The second, a stone home belonging to Adam Stephen, the founder of Martinsburg and an American Revolutionary War general, showed how wood-hewn structures were replaced by limestone. 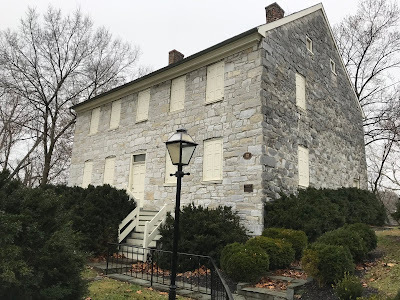 Built between 1782 and 1789 on the outskirts of Martinsburg, it's very like that Joseph Kirk would have seen this home. Where did Joseph Kirk Live? The question remained: where was Joseph's l00-acre farm located? 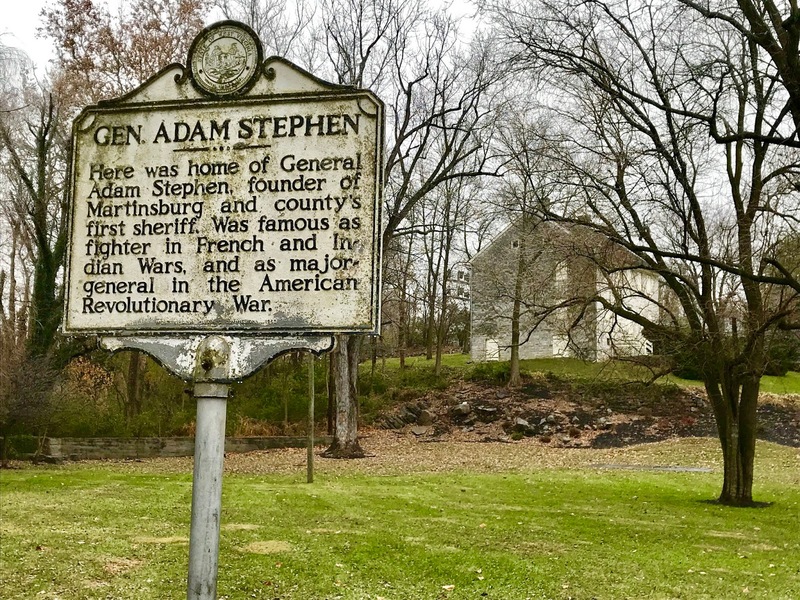 George William Fairfax's will, filed in England, included a small additional clue as to the location of the 1700-acre Poplar Spring tract: "...near the Opequon..." Indeed a small clue. 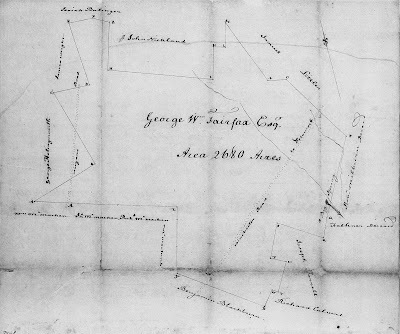 During last weekend's research stint in the Family History Library, I discovered a land survey conducted by Thomas Rutherford and dated February 20, 1763 that plotted 2,680 acres belonging to George William Fairfax. 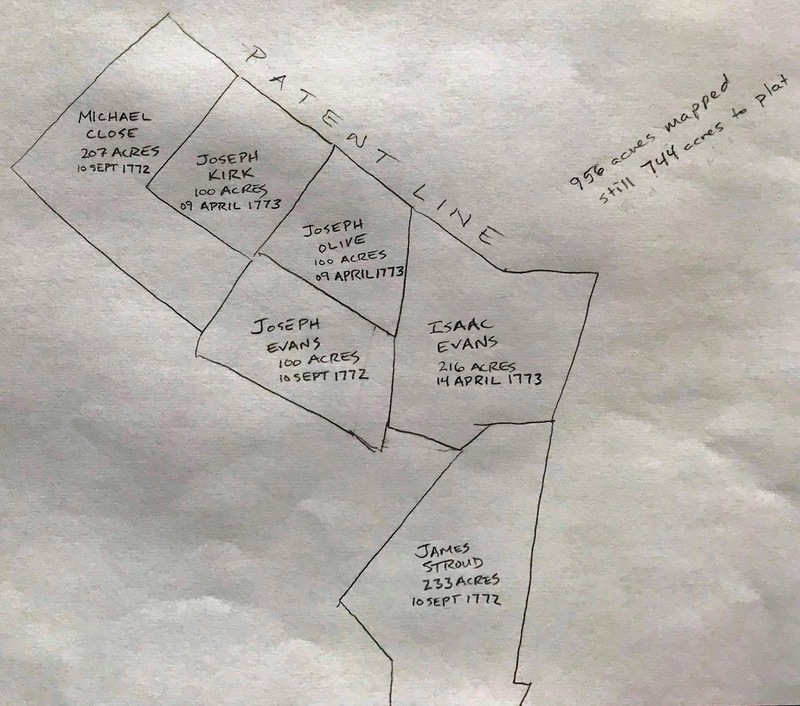 Was the Poplar Spring tract part of this acreage? 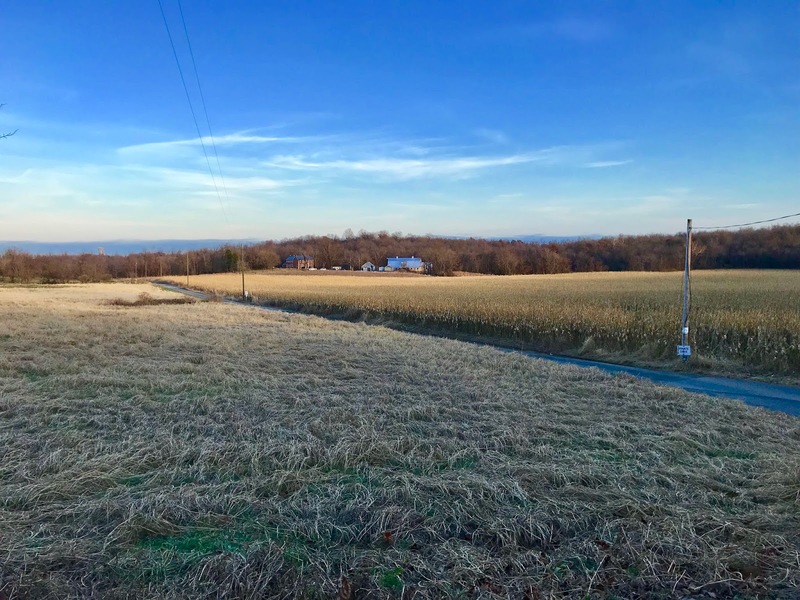 Several of the Poplar Spring land transactions cited a survey conducted by Rutherford. I was struck by the appearance of the Winchester Road cutting through the property (right side of the survey) and the identification of the Big Spring with the waterway flowing west. The Big Spring is still on the east side of the Winchester Road (Highway 11) just across the street from Fort Evans. The flowing waterway is known today as Evans Run. 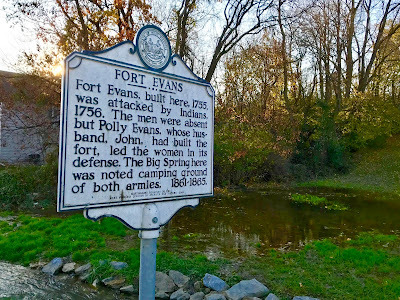 Fort Evans, a two-story stone structure, was built in the mid-1700's by John Evans. John Evans was a nearby neighbor of Joseph Kirk. 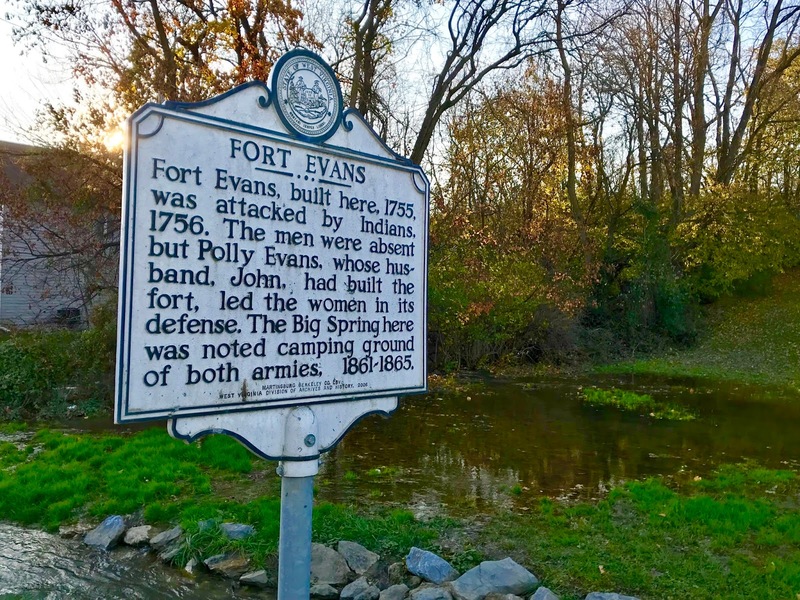 No doubt Joseph would have seen - maybe even been inside Fort Evans - which today is a private residence. At the Berkeley County Library in Martinsburg, I found a published genealogy on the Evans family. 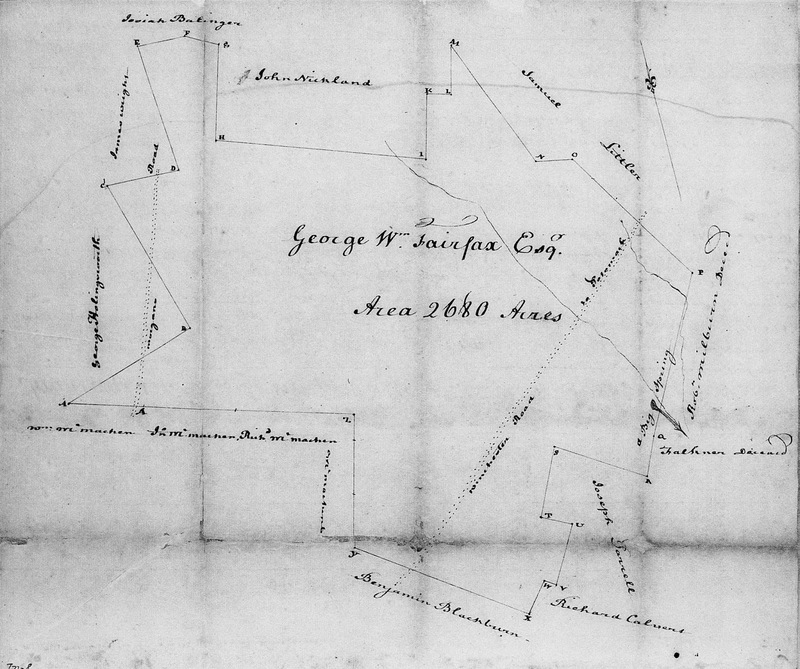 It included a sketch of the land owned by brothers John and Isaac Evans. 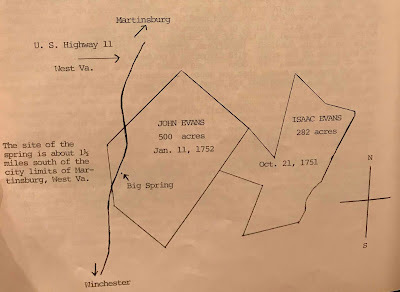 The sketch of the Evans' land included the Big Spring and the Winchester Road (Highway 11) both of which appeared on Rutherford's 1763 survey of Fairfax's land. Examining the contours of the Evans' land boundaries, I immediately thought of the Poplar Spring tracts that I had previously platted. 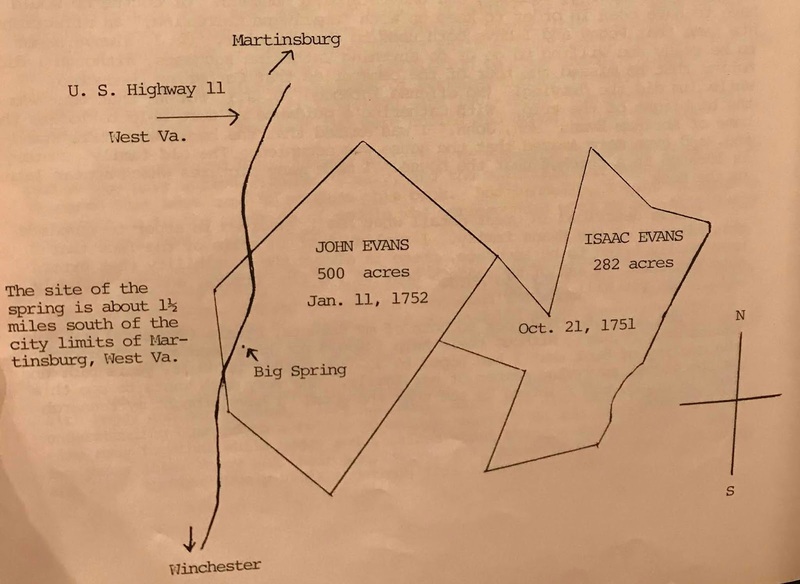 Note the northern border of Isaac Evans plot above with the contour of his plot below. The resemblance is striking. But the land ownership dates conflict. 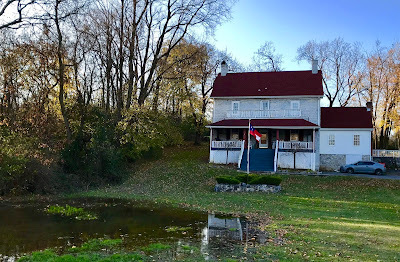 I suspect the plots sketched above (with ownership dating to the 1750's) are to the east of the plots sketched below (with ownership dating to the 1770's). From the published Evans family history, I learned that a gentleman named Galtjo Geertsema platted many of Berkeley County's early land records. Many of these records are now held in the Berkeley County Historical Society (which was closed during my road trip). I'll need to make inquiries to learn what answers those records may hold. 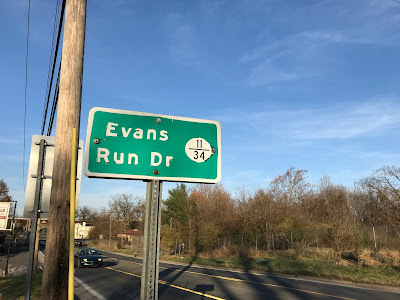 In the meantime, I followed Evans Run and imagined the land without its modern housing developments. I drove around a forest of trees that survive around the waters of Evans Run. From a southern vantage point looking north, I gained a glimpse of what the raw territory might have looked like when Joseph Kirk was a farmer in the area. It's a beautiful landscape and slowly giving way to my Kirk family history. I'm already looking forward to my next visit and any new pieces of the puzzle that I might uncover. Looks like a great road trip! It was a lot of fun (well, minus the driving rain on the drive home)! How wonderful that some of those structures still exist and have been preserved. And I love how you found a perspective where you could imagine the land as it looked in the 18th century. Thank you, Amy. The buildings sure helped create context and allowed me to better imagine Joseph's world. If you squint your eyes, you can almost picture farmers like Joseph caring for those open fields. What a great trip! 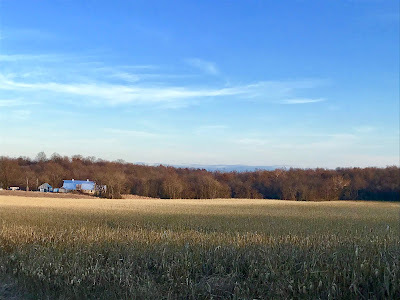 I'm lucky to have cousins still running a 150-year-old farm with other ancestral farms nearby and to also be able to kind of picture what it was like so long ago. And there are more to find! That's amazing that your cousins still run the 150-year-old family farm. If only those walls/fields could talk! Just imagine the stories. How fun! 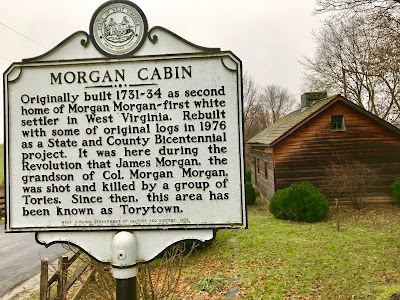 I took a similar recognizance trip to Page Counry, VA. I think you are onto something. I took a look at Google maps to find where Martinsburg is located. It looks like Evan's Run feeds into Opequon Creek. Hopefully the plat book is the answer!! Thanks, Sierra! Fingers crossed that the plat books do hold some answers.